Jackie Chan (成龍) shared many stories of his youth and love life in the recently-published autobiography Jackie Chan: Got Old Before Growing Up <成龍：還沒長大就老了>. However, the book avoided mentioning Etta Ng (吳卓琳), his illegitimate daughter from a brief affair with actress Elaine Ng (吳綺莉) in 1999. He also admitted that he did not leave any money to his daughter in his will. As a result, Jackie was criticized for being a heartless and careless father. In March, Elaine was arrested by the police for allegedly abusing 15-year-old Etta. Due to the stress of being a single mother, Elaine turned to alcoholism and had physical skirmishes with Etta. The case brought to light Elaine’s struggles, as well as curiosity as to whether Jackie will finally lend a helping hand to the daughter he had denied for years. After his son, Jaycee Chan (房祖名), was arrested for drugs last August, Jackie said his mind became enlightened. His state of mind has completely changed and he has learned to slowly let go of his stubbornness. In February, Jaycee was released after serving a six-month prison sentence in Beijing. Jackie felt Jaycee has matured a great deal after the experience. Jackie smiled at the thought of his son, expressing that Jaycee is now prepared to handle all sorts of challenges. Although Jaycee is not yet ready to face the camera, he has already been doing behind-the-scenes work. Jackie can confidently say that he has lived a life filled with adventure, passion, and risks. Being a performer enabled him to travel a lot since his youth. Jackie shared that he once had a passionate love affair with a disfigured dance hostess in the 1970s. After their first meeting, the two never met again until two years later, when the woman suddenly contacted Jackie, wanting to see him. The hostess and Jackie remained in contact for the next few months, but it was always the hostess who would contact him first as she refused to leave Jackie her contact number. One night, Jackie requested the hostess to meet him at his home, and she reluctantly agreed. Although it was in the middle of the night, she wore sunglasses and gloves. She did not turn on the light. She then took off her glasses and told Jackie that her face was disfigured when she failed to commit suicide two years earlier. When the woman met with Jackie again the following night, Jackie immediately hugged her. “I held onto her on the bed, and I could feel that she had burn scars all over her body. At that time, I only had one thought in my mind — and that was I could not say no to her. I don’t want her to think that I was like the others who looked down on her.” Jackie and the woman never met again after that night, but he would always remember her beauty. Reading the recent interview articles of his here in jaynestar, I feel that the title of his biography is perfect. His thought process is still of an immature (and irresponsible) man child. Both Jackie’s children, Jaycee and Etta, were the result of unplanned pregnancies. I sense that if Joan Lin had not carried a boy, Jackie may not have married her. Joan and Elaine’s personalities are also very different. While Joan is docile and willing to accommodate Jackie in every way, Elaine appears to be very stubborn and headstrong. When she announced to the press that she was pregnant with Jackie’s baby in 1999, her confrontational tactics did not sit well with Jackie. He initially denied the baby until Elaine asked for a DNA test. Perhaps Jackie’s poor relations with Elaine has shaped his unwillingness to reach out to Etta. That’s Jackie in essence. Full of excuses. A responsible man will reach out unless Elaine made it difficult by shutting the door. lol,you hit the nail on his head. he even have not the guts to face his daughter,i dont know what his problem is to not acknolegde his illegitimate child, its sad but his daughter has to bear the fault that his father have made. if jacky is a real man he should give his daughter the same threatment as his son jacee. Jackie Chan needs to just shove it! No more books please, as none of us are interested in reading about your sexcapades, nor are we interested in hearing you ‘brag’ about what a disgusting husband and horrible father you are (and a despicable human being to boot)! Oh and if you ever do open a museum, hotel, or vacation resort, make sure to tell us the name so we never go visit…lol! Nodding and agreeing to all commenters on this thread. As for title: “Jackie Chan Feels Guilt Towards Illegitimate Daughter” … no sh*t. If he cannot feel anything at all, is he even HUMAN? Why is anyone even according him ‘Big Brother’ status like as if his opinions/actions are gold? I also agreed with all of you here. If Jackie Chan can be 1% of the man in real life of the roles he played in his movies than he should acknowledge his daughter. Why does he bother saying that he feels guilty if he is not doing anything to make her life better. 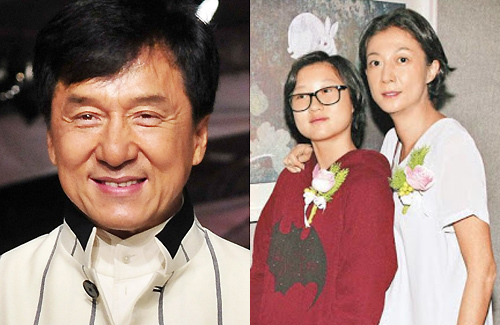 She is 10 times better off having a regular man as her father than someone like Jackie Chan. He is a terrible father to his son and a lousy husband to his wife.